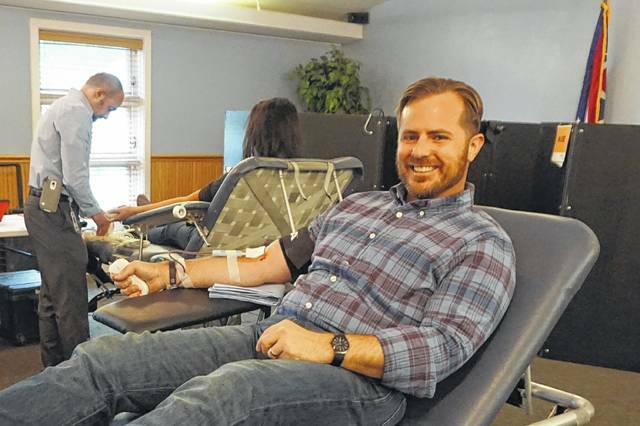 If you had arrived at 2 p.m. sharp Sept. 1 in the conference room of the Genoa Township Administrative Office to speak with State Representative Rick Carfagna, you might have missed him — he was in an adjoining room donating blood for the American Red Cross. Elected to his first term in November, Carfagna was no stranger to the Statehouse. After graduating from John Carroll University with a degree in Political Science, he served as a legislative aide in the House of Representatives in 1999. One bill, co-sponsored with Andrew Brenner (R-Powell), was signed into law to assist the Delaware Area Career Center after a snafu with a ballot issue. Finally, Carfagna has a bill to introduce advanced computer science classes in grades kindergarten-12. He said the classes would be in coding, web design, or app development, software technology. The bill has passed the house with bipartisan support before the break. Although he now has a different office on High Street in Columbus, Carfagna and his wife Jill and daughter Isabella still live in Genoa Township and attend St. Paul Catholic Church in Westerville. And if you missed him on Friday, he has a message for you. Rep. Carfagna can be reached at Rep68@ohiohouse.gov or 614-466-1431. For more information, visit www.ohiohouse.gov.